Many times, we evaluate a car by how fast it can go. We talk about acceleration, top speed, and all the other factors associated with speed. However, when you’re zooming at 100km/h down the highway and you need to slow down, putting your foot out and pressing it against the road isn’t going to cut it. Hence, the amazing but often taken forgranted invention we call brakes! Today, we’re going to look into how precisely brakes work to stop a car. To understand how brakes work, we’re going to have get into some physics. All brakes function on the principle of the conservation of energy which states that energy cannot be created or destroyed, but can be altered into one form or another. When a car is moving, it possesses a huge amount of kinetic energy (movement) which is transformed by the application of the brakes into heat energy through friction. When you stop a moving car, the brakes can heat up to temperatures as high as 500°C or more! To prevent the brakes from melting and being ineffective the next time around, all brakes are made from heat-resistant materials such as alloys, ceramics, or composites. However, car brakes are more complex than that. At the speeds cars can go combined with the mass of the car, simply jamming even both feet down on a brake pedal is far from enough to stop your car as quick as you would need it to. How did car makers get around this? By applying hydraulics, which uses an incompressible fluid (in this case, brake fluid) to transmit and multiply force, one foot on the brake pedal now generates enough force to get all four brakes to work effectively. Precisely how this works is simple in theory – pressing your brake pedal causes a piston to enter a long, hydraulic-fluid filled cylinder. This narrow cylinder feeds into larger cylinders next to the brakes. This causes the force of your initial press on the pedal to be multiplied greatly, causing the brakes to clamp firmly against the wheels. Brake fluid itself is specially designed to withstand cold without thickening and heat without boiling, both of which would be disastrous for braking. 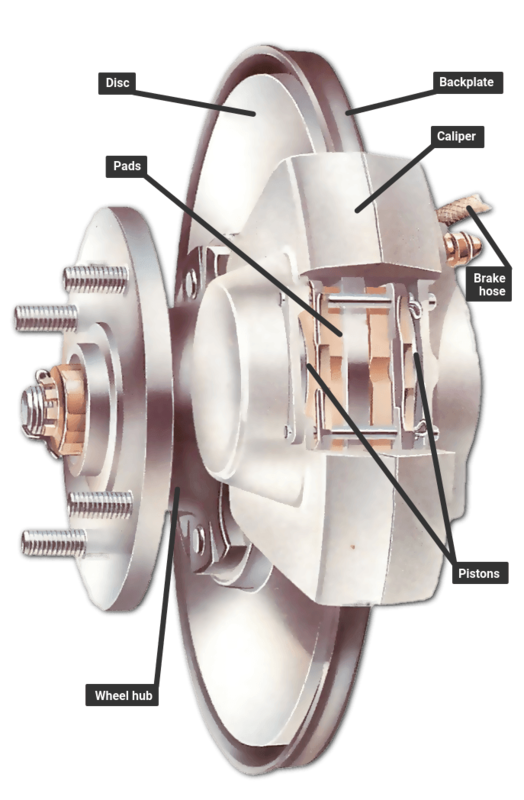 In most cars, there are two types of brakes that are normally used. Disk brakes are usually attached to the front wheels of the car. Brake fluid is pushed into a caliper which applies pressure to a piston which in turn causes two brake pads to contact the wheel which then slows the wheel down. Most back wheels have either drum brakes or disk brakes. Drum brakes work slightly differently where the drum rotates with the wheel. When the brake pedal is pressed, brake fluid pushes the brake shoes which forces friction linings against the drum which generates the necessary friction to slow the wheel down. 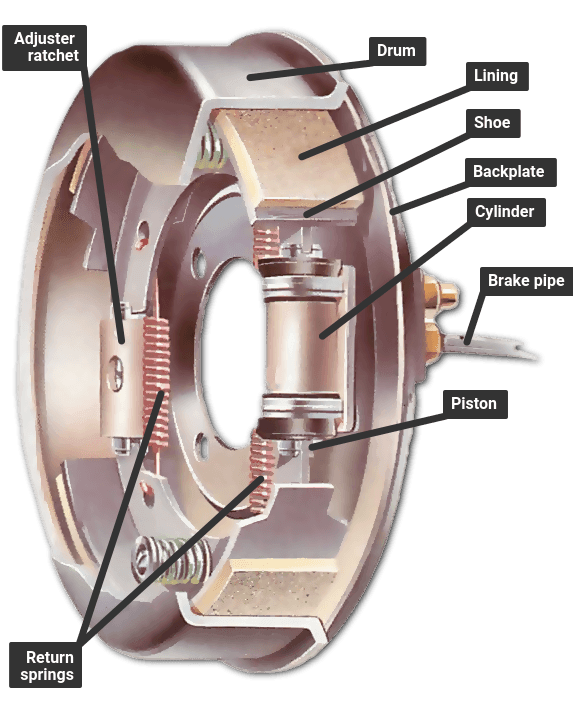 The last type of brake that all cars have is the handbrake which is a mechanical break acting on two wheels – usually the back ones – in case the hydraulic system fails completely. It can provide limited braking capabilities but it is mainly used to as a parking brake. WARNING: Brake pads and brake shoes need to be changed periodically, so please make sure your mechanic checks them out whenever you service your car. Some brakes come with brake pad warnings, if you hear a squealing sound coming from your wheels, get your to a shop ASAP to check the brakes as wearing through your brake pads causes a severe loss of braking efficiency AND can damage your brakes. And voila, you now know a bit more about the marvelous invention that is the brake. Liked this? Drop a comment!